FREMONT, Calif.--(BUSINESS WIRE)--Perfect365®, the Webby-nominated, free makeup and beauty platform loved by celebrities and more than 100 million users that is leading the digital beauty evolution, has partnered with celebrity makeup artist Gucci Westman for the Badgley Mischka show at New York Fashion Week. For the second season in a row, Westman used the Perfect365 PRO app to create the makeup look for the show in place of using traditional paper face charts. Perfect365 PRO is the first and only Augmented Reality platform that allows makeup artists to develop looks prior to real-life application, while communicating with clients through virtual try-ons where users can try on makeup looks on their photos or live using the “Live Mirror” feature. Gucci Westman is one of the world’s top celebrity makeup artists with clients that include Drew Barrymore, Julianne Moore, Gwyneth Paltrow, Cameron Diaz, Jennifer Lawrence and Anne Hathaway. Gucci has been a consultant for many years for top makeup brands and has always been sought out for her expertise to develop colors and create looks for each season. She was Artistic Director at Lancome, Global Artistic Director at Revlon and currently is consulting for skincare specialist brand SKII. For NYFW A/W 2018, she designed the makeup look for the iconic designers Badgley Mischka. 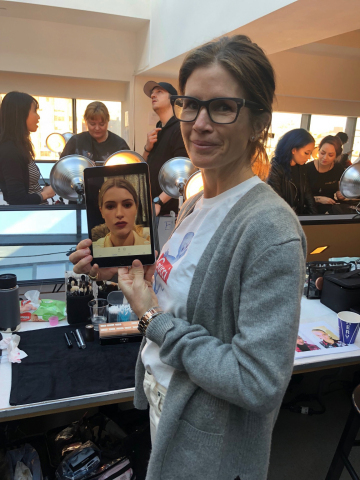 As part of this partnership, Perfect365 users can try on the look created by Gucci Westman directly within the Explorer section of the app after the runway show. “We are thrilled to work with a makeup artist as renowned and respected as Gucci Westman. Perfect365 PRO has continued to gain traction among makeup artists interested in designing looks for clients, in addition to its continued usage at NYFW to communicate makeup looks backstage,” explains Cara Harbor, Director of Marketing, Perfect365, Inc.
Perfect365 PRO is a platform specifically designed for makeup artists to be able to communicate more efficiently with their clients, develop looks for them prior to real-life application, and manage and organize client profiles. Consumers are able to find makeup artists (including brand specific artists) in their geographical area or communicate with their existing makeup artist. Providing the client with a realistic view of what makeup will look like on their unique face helps the MUA to set realistic expectations for their clients. Perfect365 PRO is designed mainly for brand counter artists and freelance/event artists, but beauty influencers can also use Perfect365 PRO to create amazing looks. Perfect365 is one-of-a-kind because it uses advanced Face Detection technology that allows for the most accurate virtual makeup placement possible, both on photos and in live video. As a result, any makeup design looks realistic because the app knows exactly where eyeshadow should be applied, how to contour the cheekbones, where to place eyeliner, and now even where to apply lashes. With more than 200 one-tap makeup looks, over 20 customizable makeup and tweaking tools, Style it! clothing and accessory recommendations, hair styles, and step-by-step tutorials for recreating looks in real-life, Perfect365 has become the go-to app for selfie, makeup and fashion enthusiasts around the world. The app has become the makeup and entertainment industries’ fully customizable digital platform, allowing users to try on looks from GSN’s hit TV show Skin Wars, Universal’s The Huntsman: Winter’s War, and Sony’s Pixels. Users also benefit from the app’s “try before you buy and apply” digital makeup looks from top brands including celebrity makeup artist Susan Thompson’s eponymous label, Michelle Phan’s beauty box ipsy, Chella and the fast growing indie label Nudestix. As a part of its commitment to building a leading beauty platform for consumers and businesses, Perfect365 seeks to actively engage in partnerships with beauty brands, retailers and artists. For more information about product partnership opportunities, please contact bd@perfect365.com. For more information about makeup artist and indie brand partnership opportunities, please contact beautysquad-artists@perfect365.com. For more information on Perfect365, high-res images, and screenshots, please visit http://www.perfect365.com/press/. The app is available for iOS (iPhone, iPad) and Android (phone and tablet) devices. Follow @Perfect365 on Twitter, @Perfect365_official on Instagram and at www.facebook.com/Perfect365 on Facebook. © 2018 Perfect365, Inc. All rights reserved. Perfect365 is either registered trademark or trademark of Perfect365 Technology Company Ltd. in the United States and/or other countries. All other trademarks are the property of their respective owners. Perfect365, Inc partners with Gucci Westman for the Badgley Mischka NYFW show. Results from a survey on NYFW beauty influences is also included.